When I say I’m living in Manila, Filippinos tend to get really excited to know where else in the Philippines I’ve been to. 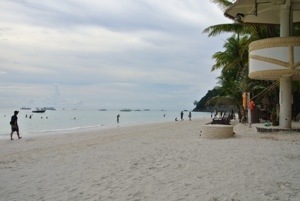 One of the most popular and easily accessible being Boracay. My awesome coworkers decided we should all go together, as a couple members of the team had never been before either. We booked our tickets on Air Asia’s website and put three of the tickets on my credit card. Side note: when I saw the credit card charge it was only $131 USD…yes, for three people round trip. I mean jesus, I can barely fly myself from NY to Boston for less than $400 USD! After finagling our work schedules, and literally pushing our one coworker out the door, we were off to NAIA Terminal 4. Turns out we were flying Zest Air, who is apparently a codeshare with Air Asia who we had booked through. Shockingly, there is a Seattle’s Best Coffee in this low cost carrier terminal, which has pretty darn good panini’s. I was so excited. Our flight landed in Kalibo and from there we needed to take a shuttle bus to the ferry dock in Caticlan, to Boracay. Originally, we were planning to stay overnight in Kalibo, since we would miss the last ferry. However, it was our lucky day. We landed on time and booked the bus and ferry at the airport. The bus took roughly an hour and a half to the dock at which we had to pay an environmental fee and a terminal fee and call a resort to book a one nights stay. We were booked into the Eco village even before we boarded the ferry, which took less than 15 minutes to get to the island. There is a much closer airport that does not require the bus ride, however the fares are typically more expensive. Our transportation from the dock to Eco village consisted of 7 of us, and our luggage, piling on a tricycle. There were a couple questionable moments going up the hills and through some street flooding, but we made it in one piece with all seven luggage bags. Boracay has become a very popular resort and party-going island, with restaurants and bars right on the white sand beach. 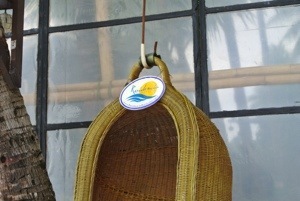 Eco village is located north of white beach and tucked into the mountain. We spent the first half of the day at Puka beach, which was quiet and relaxing with coral sand. Going from Puka to strolling White beach in the afternoon with all its activity, was a different change of pace. One place off the beach I absolutely loved was Jonas fruit shake and snack bar. The banana chocolate peanut shake and the mocha rhum shakes, were fabulous. That night we had the best Italian food I’ve had since leaving NY. Restaurant Aria had great pastas and wood fired pizzas. But the night wouldn’t be complete without some beachside dancing at some of the popular beach bars. The following day we set off on a relaxing sail around followed by watching multiple groups of Koreans wearing child’s swimmies, water jackets, and pearl necklaces in the water. (?) Don’t worry I definitely took photos. My coworker told me the swimmies are apparently a fashion trend, when I pointed out that the women using them were actually swimming and not just floating. Hmm. Certainly a bizarre fashion statement. Our final dinner was spent at the regency buffet, (my friends really like buffets). I’m usually not a huge buffet person except for the fact that this buffet had medium rare NY strip, garlic mashed potatoes and mixed vegetables. Sold. I had no idea how much I missed it. They also had three lovely ladies who, of course, sang cover songs new and old beautifully…damn them…and a fire show, that happened to have a lady boy flame thrower. To cap the evening, we had masseurs waiting for us at the hotel for the whopping price of 350P, $9 USD, and a bottle of wine. None of us wanted to leave. Zest Air is a low cost carrier partnered with Air Asia. On Sunday evening one of my coworkers received an email that her was flight was cancelled and she was rebooked on a flight which was over an hour earlier. We thought it was suspicious that the other two reservation holders hadn’t received an email. Sure enough, in the spam folder, there were notifications, however some of our flights were rescheduled to over an hour later than originally scheduled. What happened to picking up a phone? Four of us left at 230am and the three of us intended on leaving around 7am. But, 7am turned into 8am after we finished with breakfast, and we ended up missing our flight. My first time ever. Fortunately, there are many flights to/from Manila, and we were able to get the next flight at no cost, but I was a little concerned since I booked with Zest for my flights the following weekend to Kuala Lumpur. Out of curiosity, I did a search on Air Asia and saw that the flight times were different then originally scheduled. Hmmm. I tweeted at both Air Asia and Zest, but only Air Asia responded and had me direct message my booking number. They then took 2 days to respond telling me to email them. Ugh! They finally sent me an updated itinerary the day before my flight. Moral of the story… You get what you pay for when flying budget airlines. The cheaper the ticket, the greater the risk.